The word “sapienza” means “wisdom” in Italian. It also refers to the Church of Saint Yves at La Sapienza, 1642–1660, designed by Baroque architect Francesco Borromini. 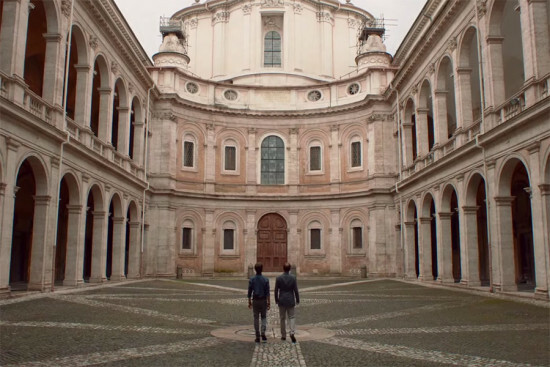 In Eugene Green’s film, La Sapienza, Borromini is a hero of the protagonist, architect Alexandre Schmid (played by Fabrizio Rongione). Borromini incorporated the remains of a 14th century church, rather than razing it, a touchstone for Schmid. Geometry reigns throughout: the building is capped by a corkscrew lantern, and triangles and semi-circles are combined with figurative elements. We see Schmid lauded with prizes signaling the pinnacle of his career. He then has a meeting with an obstinate client who wants to take the guts out of his bucolic planned community and make it into a featureless block. Given an ultimatum, Schmid decides to take a break and head to Italy to follow Borromini’s architectural trail to resume a long gestating book project. He spends time in Rome (in particular at La Sapienza), the city where Borromini was first great friends and then rivals with Gian Lorenzo Bernini. Borromini’s work was overshadowed by Bernini and Pietro da Cortona, who were favored by Sir John Soane and others, which Schmid wants to rectify. On Alexandre’s architectural pilgrammage, from Stresa on Lake Maggiore, to Turin, Rome, and finally Bissone, he is joined by Goffredo, a young Italian who is about to start architecture school in Venice. Through them, we lovingly see Borromini’s architecture which also unlocks and mends their psyches. La Sapienza, directed by Eugene Green, will have its U.S. theatrical premiere on March 20 at the Lincoln Plaza Cinemas in New York City followed by release in select U.S. cities. The film was an official selection at the New York and Toronto Film Festivals.